Saturday, I had nothing to do except for my visit to daughter which I planned to make short. So when I was done with my visit to my one and only daughter, I was standing on the road side and was contemplating and confused at the same time thinking where was I to go after. I didn't want to go home up north just yet adding up to my dilemma. It crossed my mind that I have always wanted to explore Manila so without skipping a heart beat I hopped on a jeepney going to train station going to Manila. I got off at Recto station and walked my way through Rizal Avenue. Rizal Avenue is one of the oldest roads that connects manila to northern metro manila. Rizal Avenue ends at Carriedo station of the LRT line 1. After walking from Recto station to Carriedo I turned right going to Quiapo Church. I went through the nooks and cranny of bohemian part of the metro and found my self at Hidalgo street. Famous for being the camera capital here in the metro, Hidalgo boasts a street full of Camera shops that sells both brand new and second hand, and Analog and Digital SLRs. Well I didn't have money at that time but what the heck, I went through the shops and ask since I was really looking for one. After Hidalgo, I went to Quiapo church and prayed for a while. I observed the architecture of the basilica minore and was disheartened. Why? 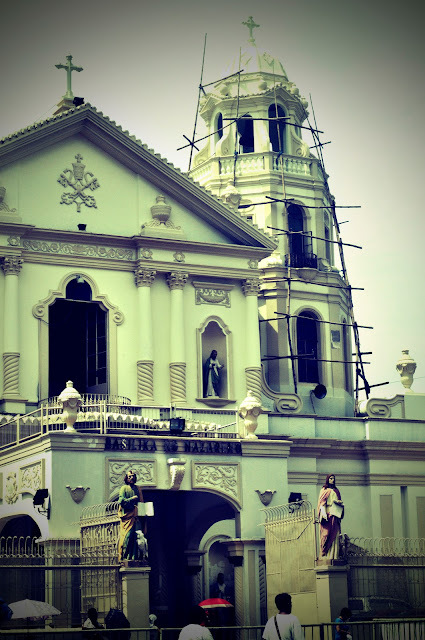 the old quiapo church was way more beautiful than the existing church. The existing church was made by this certain architect that I cant actually deter what statement was it trying to send across. As I went out of the church this sea of people walking towards every where I swam and struggled through this street filled with people doing their own business. Truly the Quipao district is as colorful and interesting as people would talk about it. It will never fail you in giving out excitement and adventure that you are looking for.